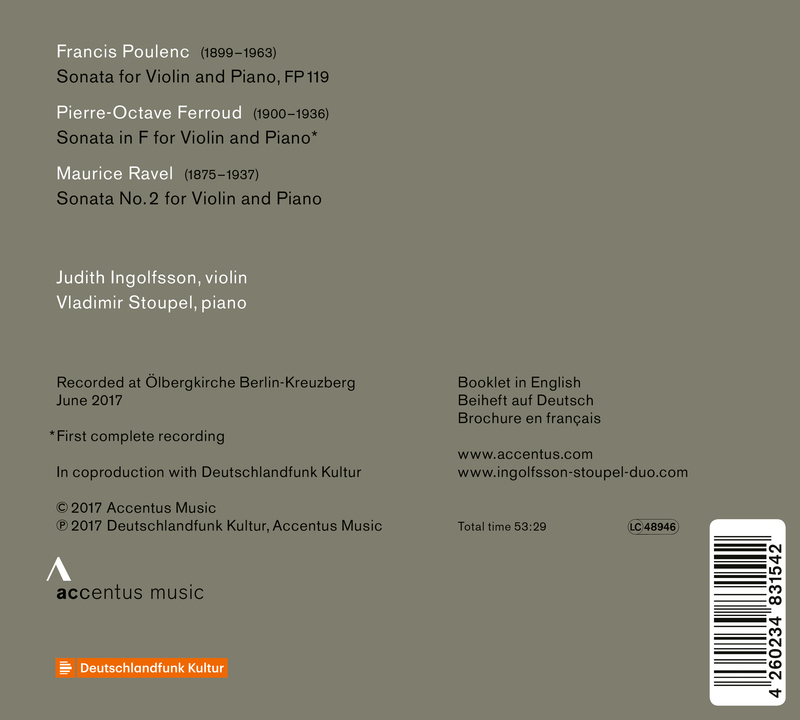 Following up on their “Concert-Centenaire” trilogy, the renowned duo of violinist Judith Ingolfsson and pianist Vladimir Stoupel have released a fourth CD on the Accentus Music label. With this new album, they focus on the sonatas of Francis Poulenc, Pierre-Octave Ferroud and Maurice Ravel. 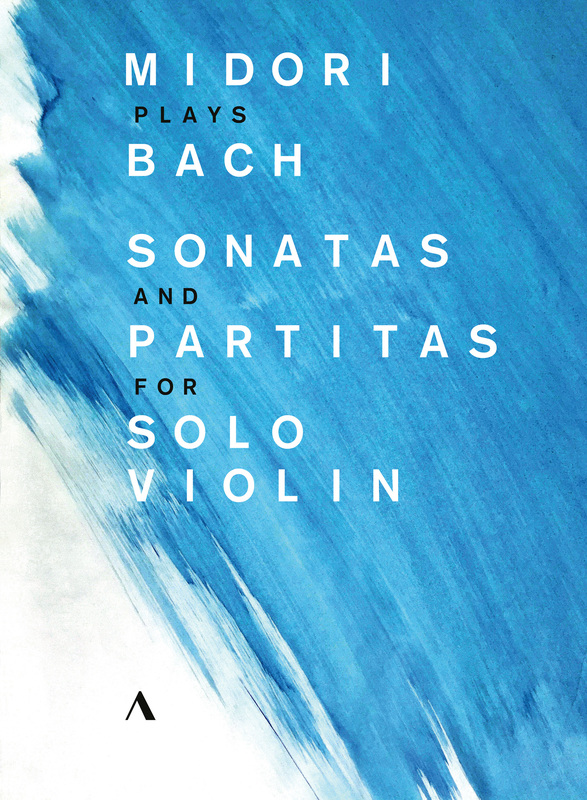 The works stand out distinctly from the entire French tradition of Sonatas for violin and piano. The album is already available in Germany and at the beginning of 2018 in other countries. For more information, click here. 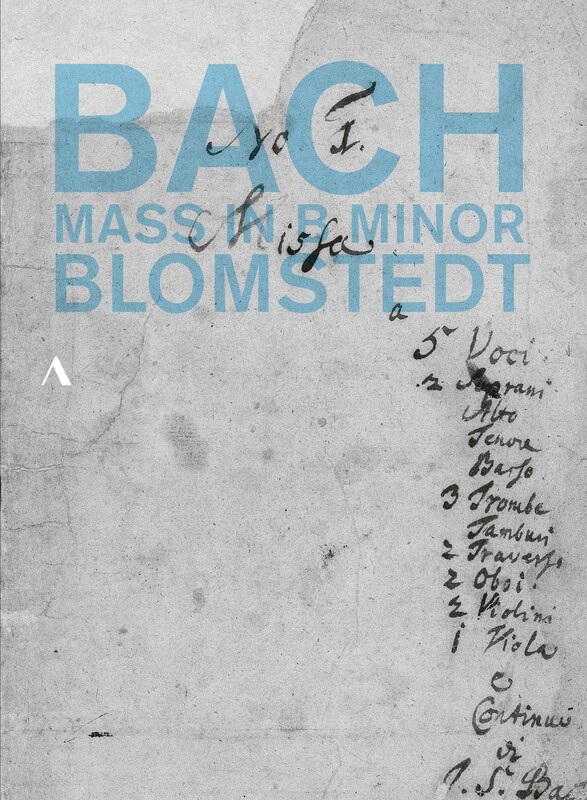 Accentus Music’s new DVD/Blu-ray of Johann Sebastian Bach’s Mass in B minor performed by the Gewandhausorchester Leipzig and the Dresdner Kammerchor under the baton of Herbert Blomstedt will be available on November 17th in Germany and soon in other countries. The concert in the Thomaskirche Leipzig concluded the Bachfest 2017. For more information about the production, click here. 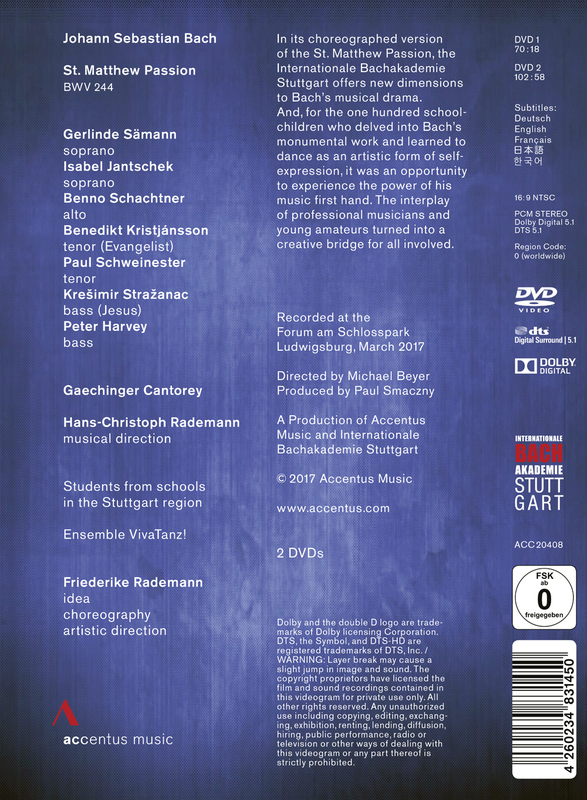 The new DVD/Blu-ray of Midori playing Johann Sebastian Bach’s Sonatas and Partitas for Solo Violin was recorded at the Castle Köthen, the location where Bach actually composed these masterpieces. 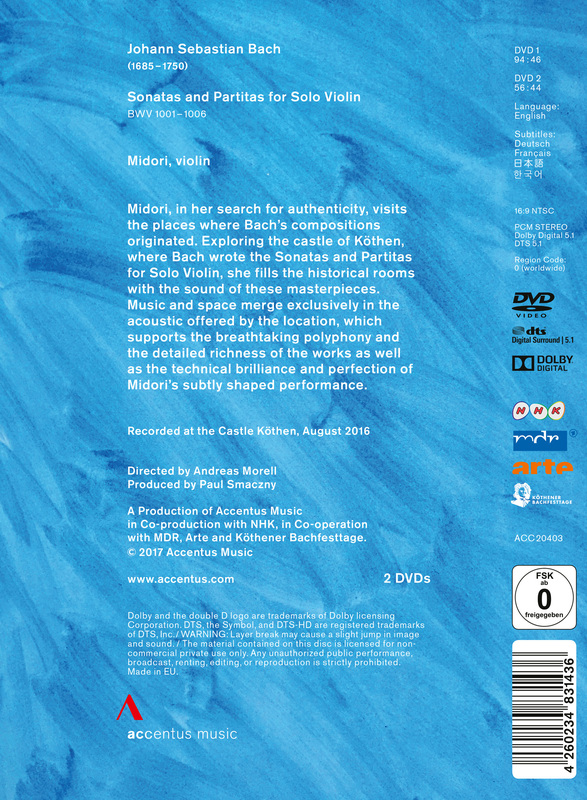 Playing in the historical chambers made a deep impression on Midori: “The sound of the music – how it actually came out, how it felt to be in those rooms – those are the memories I will take with me.” The DVD/Blu-ray will be available in Germany on October 27th and soon in other countries. For more information, click here. 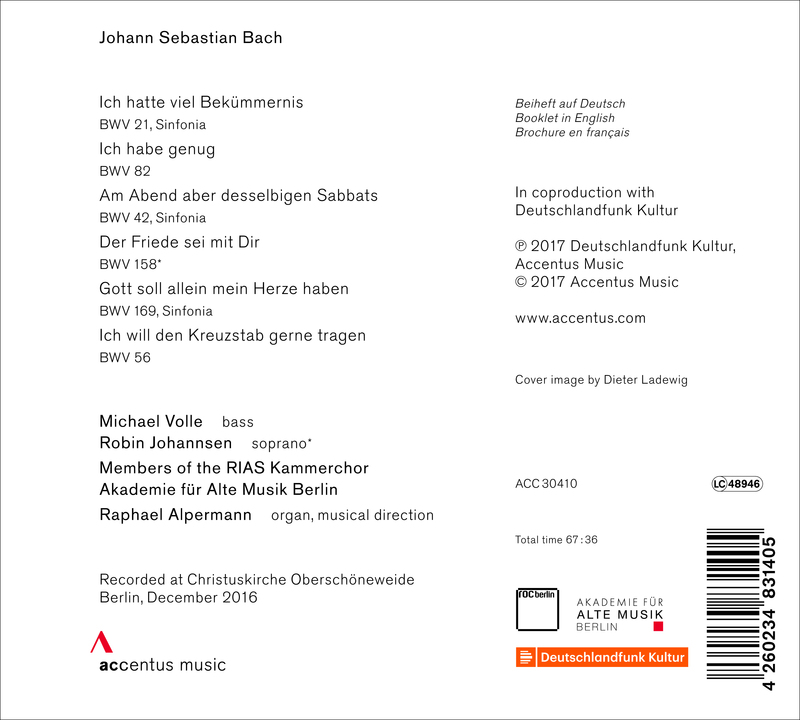 Accentus Music’s new CD with Solo Cantatas for Bass by Johann Sebastian Bach will be available from September 15th in Germany and later that month in other countries. The works were recorded with the Akademie für Alte Musik Berlin and singer Michael Volle at Christuskirche Berlin in December 2016. For more information click here. 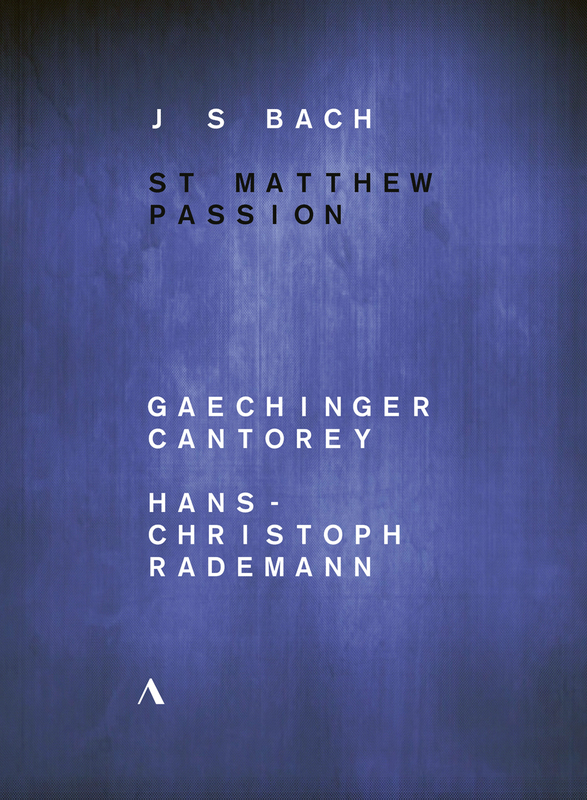 Accentus Music’s new DVD of Bach’s St. Matthew Passion will be available in Germany in the middle of September and at the end of the month in other countries. Hans-Christoph Rademann and the Gaechinger Cantorey performed this monumental work together with one hundred schoolchildren, who, under the direction of Palucca pupil Friederike Rademann, danced and expressed themselves on stage. For more information click here. 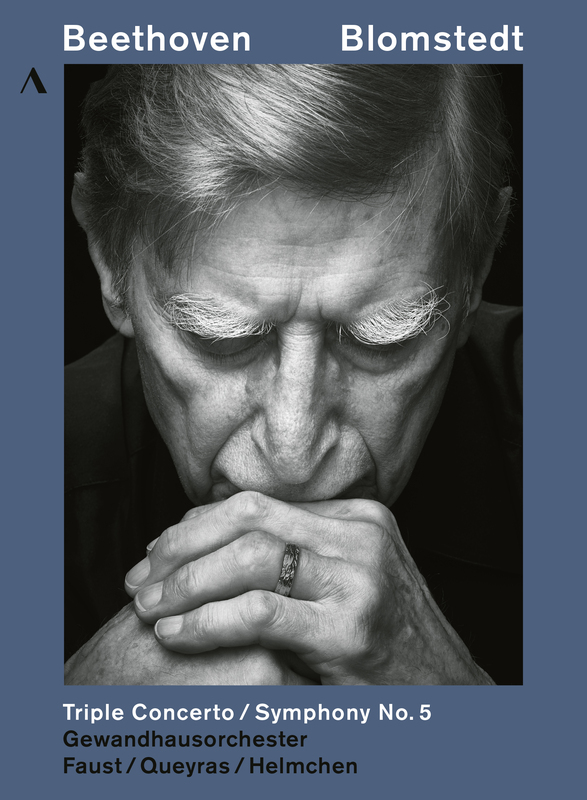 In celebration of Herbert Blomstedt’s 90th Birthday in July 2017, Accentus Music releases a new Beethoven cycle that captures the spirit of the long-standing partnership between the legendary conductor laureate and the Gewandhausorchester Leipzig. 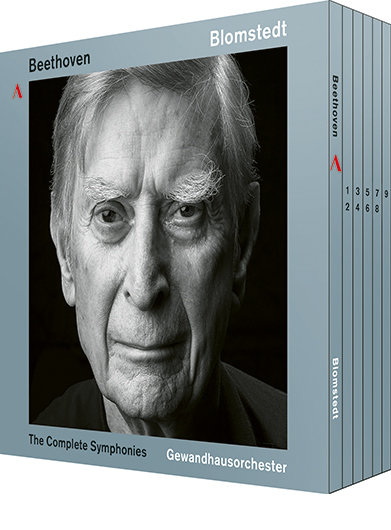 All nine symphonies, released in a box set containing five CDs, are live recordings made at the Leipzig Gewandhaus between May 2014 and March 2017. 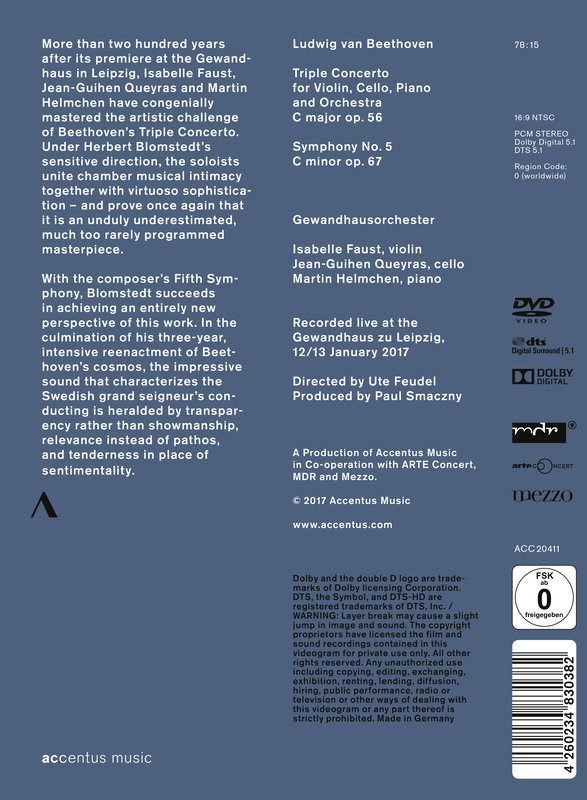 The box set will be available on June 30 in Germany and soon in other countries. For more information click here. 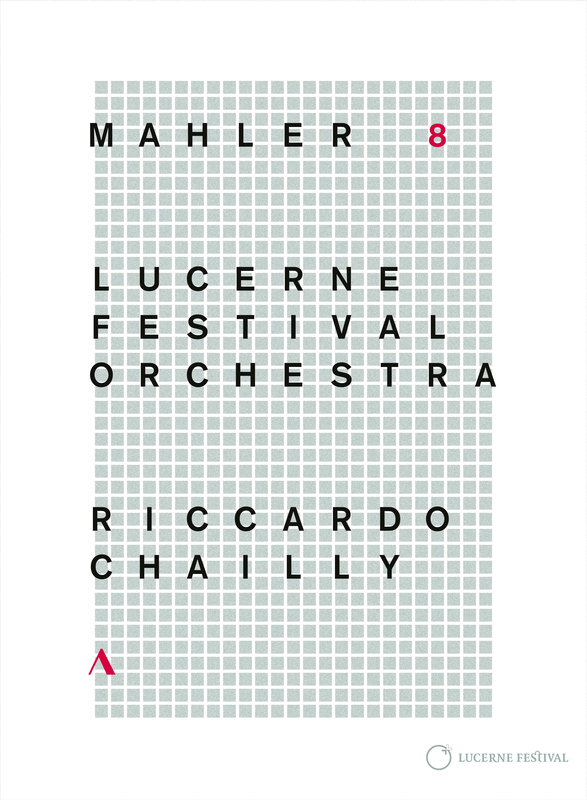 In August 2016, Riccardo Chailly premiered as the new music director of the Lucerne Festival Orchestra and hence as Claudio Abbados successor. 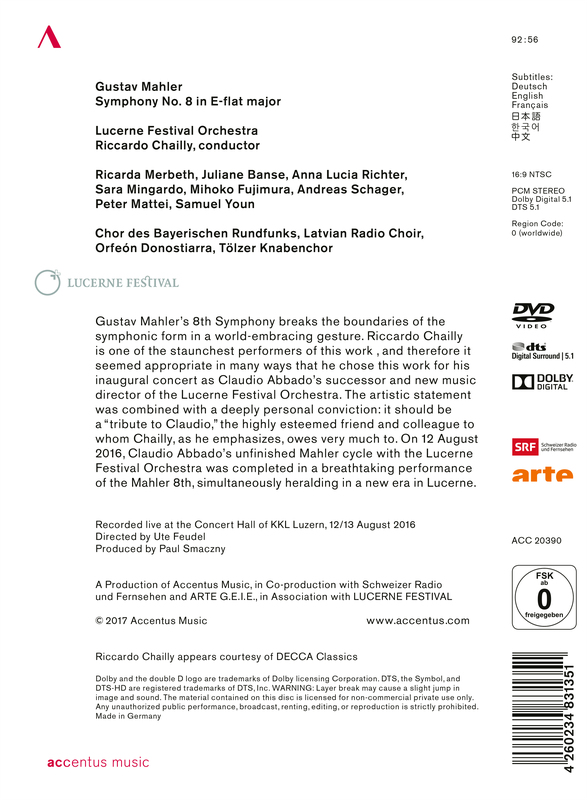 Simoultaneously they completed Abbado’s unfinished Mahler cycle with the LFO in a breathtaking performance of the 8th Symphony as a “tribute to Claudio”. 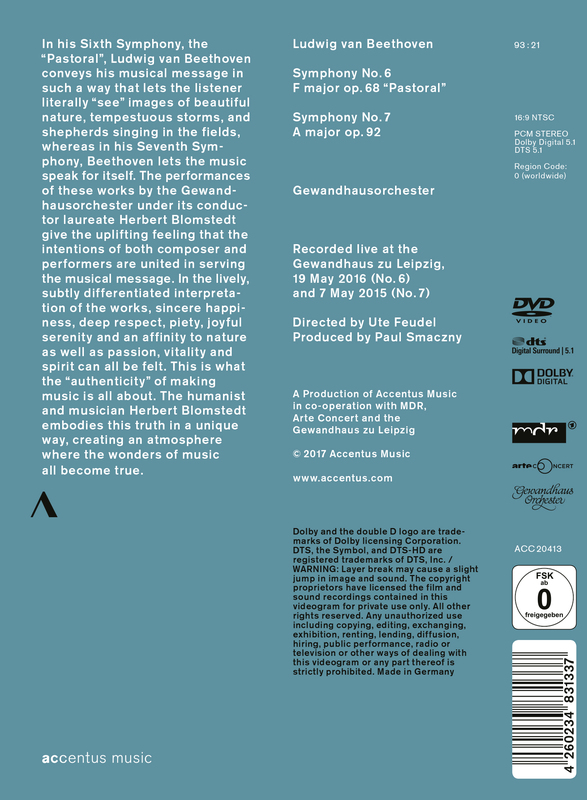 With this release, Accentus Music completes its Beethoven DVD trilogy that started with Beethoven’s Ninth, Sixth and Seventh Symphonies performed by Herbert Blomstedt and the Gewandhausorchester Leipzig. 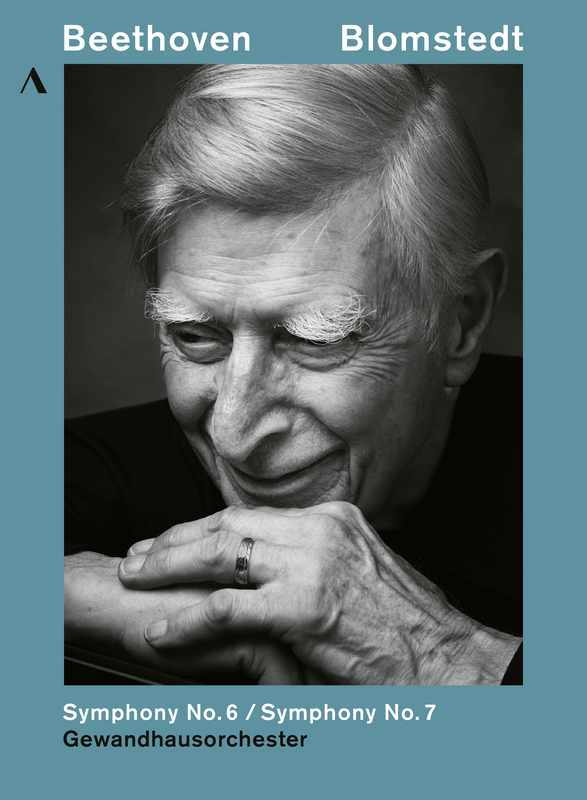 It also leads the way to the release of all Beethoven Symphonies in this summer, recorded between 2014 and 2017 at the Gewandhaus zu Leipzig and conducted by the maestro, who is celebrating his 90th birthday in July. For more information click here, you can watch the trailer here. 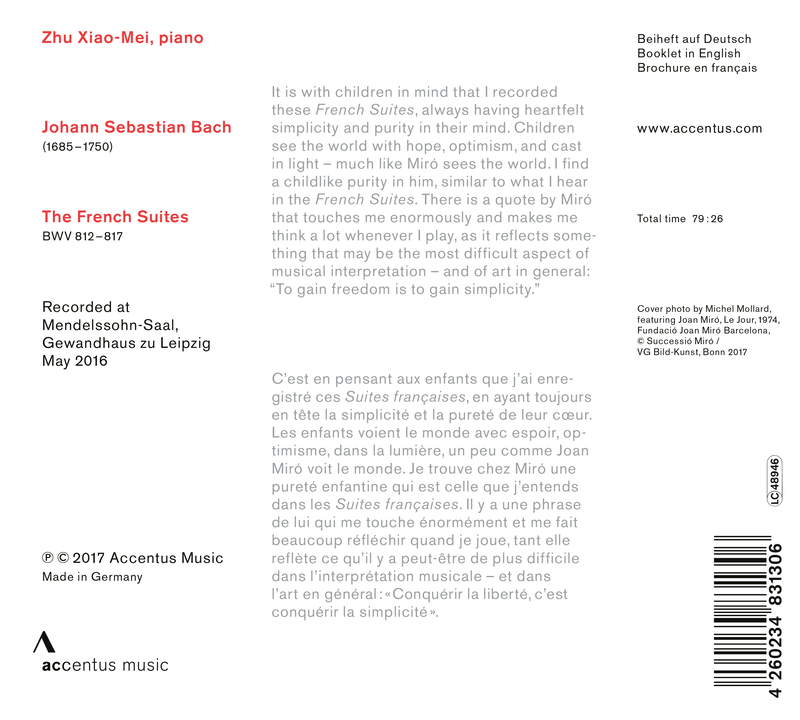 The new recording of the French Suites by Johann Sebastian Bach is the fourth CD release of Zhu Xiao-Mei on the Accentus Music label and will be available on May 19 in Germany and soon in other countries. It will also be available on most digital platforms. For more information about the album please click here. Zhu Xiao-Mei and Accentus Music plan to continue their collaboration with a recording of Bach’s English Suites by the end of this year. 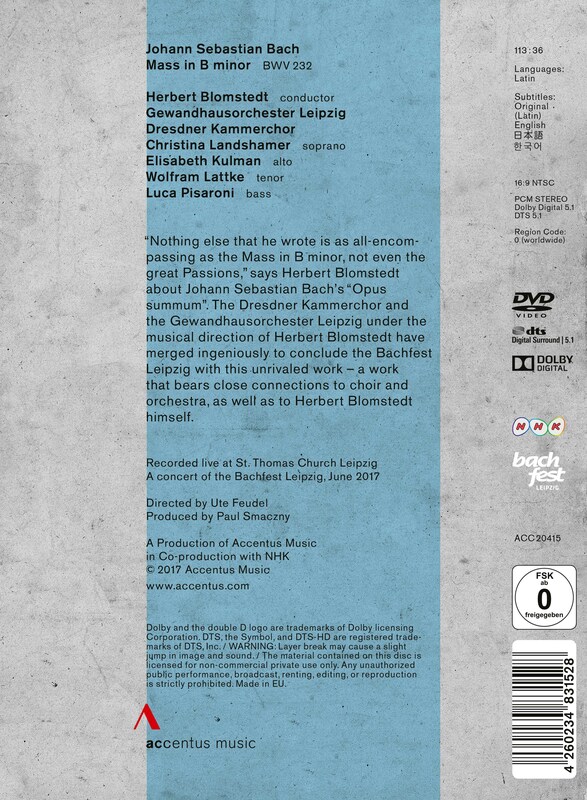 Accentus Music’s new production will be available on April 28 in Germany and soon in other countries.